1st Dec, 2015: One Day Faculty development workshop on “Research Methodology and Statistical Tools in Research. 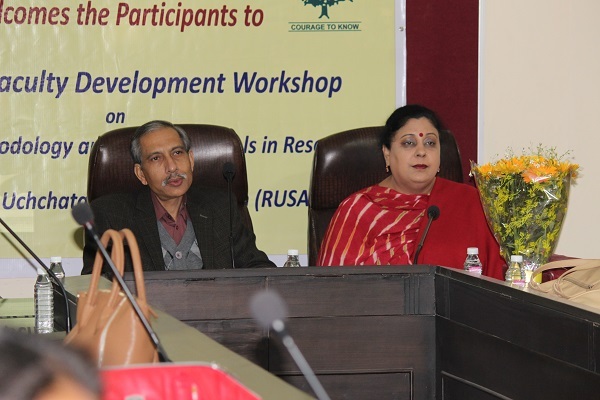 A one day workshop on “Research Methodology and Statistical Tools in Research” was organised as a part of Faculty Development Programme under the aegis of RUSA in PG Govt. College for Girls, Sector-11, Chandigarh today. Prof. Narinder Kumar, an eminent scholar from Department of Statistics, PU Chandigarh was the Resource person. The workshop was inaugurated by the Principal Dr. (Mrs.) Anita Kaushal. Dr. Binoo Dogra (Dean) and Dr. Rama Arora (Vice-Principal) on this occasion. Prof. Pardeep Singh Walia welcomed the Resource person and delegates. More than 120 delegates participated in the workshop.